Window treatments are one of the best ways to enhancing any room in your home. Allure window coverings has been helping customers for over 15 years. We have many styles, colors and textures to choose from. Allure window coverings is your local resource for your interior design needs, including window coverings from Hunter Douglas. Count on the knowledgeable and friendly professionals at Allure window coverings to coordinate your decorating project from start to finish. Our distinctive services include professional measuring, experienced installation and stylish design advice, all provided with a local flair since we're independently owned and operated. Allure window coverings has proudly served the Clackamas, Multnomah, and Washington county areas since 2007. Whether your priority is energy efficiency, privacy or room darkening, ease of use or child and pet safety, you can count on the design team at Allure window coverings! You'll find everything you need to transform your living space into your dream home. Contact us today to get started with your project! I will help you love your home a little more! Interior design is my passion and windows are a critical element of any space, which is why I love styling them. I have 31 years of experience in the interior design industry, including having owned my own window covering business, and bring extensive knowledge and exceptional service to each new client and project I take on. I am trained in color consulting and my work has been published in Window and Wall Magazine. Nothing pleases me more than making my clients decorating dreams come true, which is why I stay current with interior trends by reading everything from Dwell and Traditional Home Magazines to participating in Houzz discussions and following designer friends on Pinterest. I have lived in Portland, Oregon for most of my life and am a member of the NE Community Center and the Window Coverings Association of America. Along with interior design, I love cooking, sewing, skiing, biking, traveling and spending time with my family. 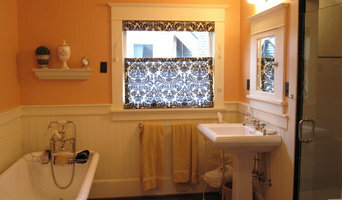 Portland Window Coverings are our specialty. We are local and in-house from our owners to our consultants, installers, and support staff. 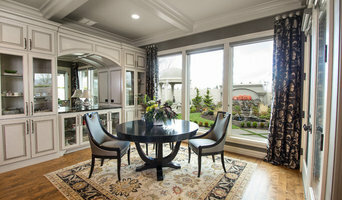 Call to schedule your free In-home consultation with a design expert today or come see us at our NE Portland Showroom. As highly trained professionals, we do it right. We stand behind our work with the best warranties in the business and it is in writing. Whether you choose wood blinds or shutters, roller shades, woven woods, roman shades, or drapery, the Budget Blinds team will provide ongoing service to make sure your window treatments last for years. No job is too big or too small. We can help you bring your window treatment vision to reality. You may live in a Pearl district loft, an old 1920's home in Laurelhurst, a brand new house in Forest Heights, or have a view looking over the St. Johns Bridge. If you combine our years of expertise with our extensive product line, and add your personal sense of style, you have the perfect recipe for stellar window decor. We carry the most comprehensive variety of brands in Portland. Signature Series, Enlightened Style, Hunter Douglas, Lutron, Inspired Drapes and Shades, Bece, Vadain, Mariak, Draper, Lafayette, Phase II, Horizons, Kirsch, Orion Iron Art, Mechoshade, Levelor and Bali as well as local custom workroom products. Whether you are moving, remodeling or have just purchased a new home or vacation getaway. The choices for window covering and finishing touches can be daunting. Life is fast. Time is short! We want to make your selections a happy ending. We offer extensive knowledge, skills, service and the desire to add the preferred touch to your project. Offering: HUNTER DOUGLAS Window Fashions Custom Drapery treatments Color consultation Space arrangement Quality - Innovation - Style the decorating dog Your friend in the window fashions industry! Design to Installation Complete. 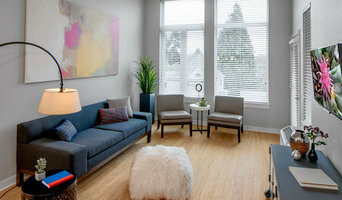 Serving Portland, Beaverton, Hillsboro, Forest Grove, Banks, and the surrounding area since 1993, Carolyn Schultz Interior Decorating is your one-stop source for all your interior design and home décor needs, including custom window shades, shutters, draperies, curtains, carpet, flooring, countertops and more. With a Master’s Degree in Textile Science and a Bachelor’s Degree in Fashion & Interior Design, both from the University of Illinois, Carolyn has the expertise to help you make the right choices of carpet, upholstery, drapery and soft furnishings for your home or business. Additionally, you will find great energy efficient and “Green” products. Some of the brands carried by Carolyn Schultz Interior Decorating include Shaw, Mohawk, Mannington, Robert Allen, Kravet, Lee Jofa, Diane von Furstenberg Home & Hunter Douglas, just to name a few! Here you will find a wide variety of Hunter Douglas window fashions, including customer favorites such as Duette® Honeycomb Shades, Silhouette® Window Shadings, and Luminette® Privacy Sheers, and hundreds of choices for color, texture, fabric and function. Great products for every budget! Choosing the right window solution can be very complex. Our experienced design professionals will work with you to find a solution that looks great and provides the privacy and light control you need within your budget. Once you’ve made your selection, our measuring and installation experts will come to your home to ensure a perfect fit for your new window coverings. Don't spend time and money on your home decorating project until you know you've made the right selections! We offer in-home design consultation, just give us a call. We can discuss your project, no matter how large or small and offer consultation service to suit your needs as well as your budget. Our distinctive services are all provided with a consumer friendly, local flair since we're independently owned and operated. Give us a call or send an e-mail today to get started! Accent Verticals has been designing custom window coverings for residents of the greater Portland and Vancouver metro areas since 1986. We manufacture our blinds in our own on-site, modern production facility. Our company has been in the blind fabrication and retail business for over 20 years. We custom make blinds and shades right here in our own shop, using the latest industry technology. So whether you order treatments that are made in our local facility, or made through one of our quality, service oriented suppliers, you are assured of the finest in workmanship and the highest standard in customer service. We appreciate your business! At Moonrise Blinds and Designs, a shop-at-home service, we bring the showroom to you. You can compare colors and styles in your own home. Most of our business comes to us through referrals. We hope to make you the kind of satisfied customer who is happy to refer us to others as well. Cascade Coil’s Home Decor products feature our coiled wire fabric used for custom firescreens, replacement mesh and shower curtains. Made in the USA and 100% recyclable, our coiled wire fabric products provide a unique look to any home. We also offer room dividers and energy saving window treatments in a wide array of weave sizes and finishes to embellish your home. Our mission is to combine the talents of our creative team with a wide range of home accents and furnishings, providing a one-stop design solution to our residential and commercial clientele. We provide custom product procurement and import, Architectural Interior design services and decorating. Home Furnishings, accents, window treatments, bedding, lighting and art can be purchased at our show room in Tigard Oregon. In our Oregon warehouse we manufacture artificial trees, plants and floral for all types of commercial and residential use. 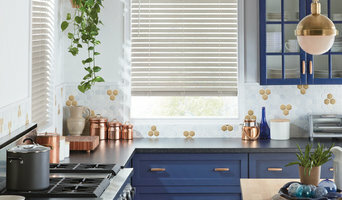 We also offer I M Window Treatments that are customizable. Our window treatment website is launching in 2016! *Authorized Dealer of Shaw Floors* The Floor Store is a full service flooring & window covering store located in the historic Woodstock neighborhood in Portland. The Floor Store is a Shaw Design Center with an extensive showroom that offers you all the latest trends & fashions available in floor covering today. We offer free estimates and have a knowledgeable staff that will help you with your next flooring or window project. Founded in 2011 by Lenora Smith, an interior designer and LEED Green Associate™, aronel design studio, inc. is committed to designing sustainable interior furnishing products. A manufacturer of sustainable fabrics, aronel design studio's digital design process makes it easy to change the color or pattern of aronel's fabrics to suit your space. Have a window to cover? You're in luck, we know how to do that! Premier Window Coverings is a Hunter Douglas Gallery dealer and we've been covering our client's windows here in Portland for the past 15 years. Our window coverings are sure to make your home the envy of the entire neighborhood. In addition, we own a local workroom, Thimble Custom Soft Goods that specializes in creating life altering draperies, valances, roman shades, bedding, pillows, shower curtains and whatever else your home, office, Winnebago, tree house, man cave, or blimp may require. So give us a call or stop by one of our showrooms to find out more about the great experience you will have! Oh, and if you really do have a blimp, call us, because that’s way cool and we want to see it. 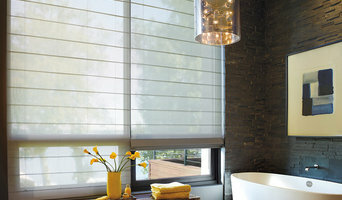 Providing Shutter, Shades, Blinds, Draperies, and other Soft Treatments to the Greater Portland Metro Area. Free in-home consultations give you the ease of shopping from home and coordinating you window coverings with your existing decor.